The shower is in many ways the center of your bathroom. If you're still displaying an old, damp shower curtain when guests enter your restroom, it might be time to upgrade to a glass shower door. You just need to choose between a framed or frameless shower enclosure. At first, this phrase might bring back old memories of thick, silver and gold trim on your parents' shower doors. While many still maintain this style in their homes, it's important to know that significant design improvements have been made to the framed shower door. Today, you have many choices of finish for that metal trim as well as glass options. Framed shower enclosures are a more affordable option and seal with a magnetic strip and rubber seal to effectively stop water from splashing on the floor. Choosing a frameless shower enclosure means opting for a much more contemporary look. They make your bathroom appear much wider and open, and also do a great job of showing off your shower tile. Without the crevices created by a metal frame, frameless shower doors are much easier to keep clean. The only downside to these enclosures is that they tend to cost more than the framed doors. At Bryn Mawr Glass, we're shower enclosure experts. 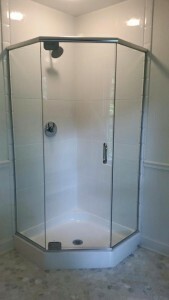 No matter which type of shower door you choose, you can trust us for even the most custom shower fittings. To get an estimate for your project, click here. 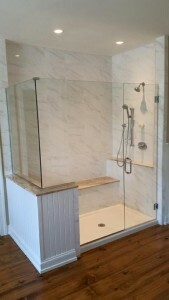 See more examples of shower enclosures.